Undecided on this election? Not sure which direction the country should follow? Here’s the way NOT to go! There are no better examples to educate people than something close to home everyone can relate to. I say that because we are constantly being reminded that we are headed toward Greece everyday. They are collapsing under their debt burden and in many respects, the U.S. is already in a worse position than they are. But I don’t believe the majority of Americans take the threat seriously because Greece is such a small island nation and we are a superpower. Apples and oranges. So perhaps a better example is one right here in America. It’s the city of Detroit. Detroit has been a textbook testbed for progressives for over half a century and has illustrated in the clearest possible terms the guaranteed failure of socialism. It’s fitting that a major plank of the progressives is equality of outcome as opposed to equal opportunity. Detroit has delivered. The following is an article from Jarrett Skorup written for the Michigan Capitol Confidential. He does an excellent job laying out the phenomenal decline of a once great city. With our oh-so-important election coming up, it’s another reminder that we need to change course in America asap. GM sets all-time record profit of $7.6 billion. Is it proof the Bush/Obama auto bailouts worked? GM has announced an all-time record profit for 2011 of $7.6 billion dollars. You will hear that endlessly this year as Obama takes credit for saving the auto companies. So once again we need to take a look back and do some fact checking. The auto bailouts, as they are known, were bridge loans extended to GM, Chrysler and their financing arms. What was their purpose? To prevent the auto companies from going into bankruptcy. As you’ll recall, they did anyway. So on its face, the claim of any bailout success is false. Bankruptcy, or restructuring, means a company has failed and needs protection from its creditors under bankruptcy law. GM and Chrysler clearly failed by going bankrupt so any claim of success due to the bailouts is a lie pure and simple. The claim that is often made is that by extending the bailout funds, the Treasury rescued the companies from completely failing and thus saved over 1 million jobs. Some industry reports claimed 3 million potential job losses throughout the entire supply chain. What happens when a company files for bankruptcy protection? They are allowed to reorganize under the protection of law which is exactly what they did. Going bankrupt doesn’t mean all the factories close, the dealerships, the suppliers and other vendors, etc. That’s called going out of business, liquidation, a completely different scenario than bankruptcy. GM and Chrysler weren’t planning on going out of business, they were trying to avoid bankruptcy, so the claim of saving over a million jobs is unsubstantiated. Now, what is the administration and the bailout defenders claim? That due to the credit crisis brought on by the recession, there would be no credit lifeline for the auto companies and they would just be allowed to fail. Accordingly, we had to tap the TARP funds to provide that lifeline no one else was capable of providing. They were needed to provide operating cash and loan funds for consumers. The claim is always made that total liquidation would occur without allowing for the likelihood of reorganization under bankruptcy protection. Scaremongering is certainly nothing new with government when it needs to put forth an agenda item and repayment of union support in the Obama election was on that agenda. U.S. is talking deal with the Taliban – I thought we didn’t negotiate with terrorists? The more things change, the more they stay the same. All throughout the 1980’s, the CIA funded the Mujahideen, predecessors to the Taliban, through Operation Cyclone. In the mid 90’s, the roles reversed leading up to 9/11 and the Taliban became the enemy. Now the Taliban have plans for retaking control of Afghanistan once the NATO pullout is complete by 2014. Low and behold, we are once again negotiating with the Taliban. The catch is this is being negotiated with the backing of Pakistan. For that to happen, the U.S. needs to get out-of-the-way, thus the accelerated timeline for our withdrawal. Defense Secretary Leon Panetta announced the new 2013 objective to the surprise of our allies including Kabul. What he didn’t say is what is becoming obvious. Karzai is going to be ousted. Absent NATO and the U.S., the Taliban will eventually retake control of the country and with the blessing of Pakistan. Iran isn’t at all comfortable with this. Somewhat ironic since they were complicit with the U.S. in installing Karzai as President. Will Karzai be allowed to stay on as a figurehead leader with the Taliban in control? No one knows how it plays out once ISAF withdraws, but that isn’t the point of this post anyway. This is not to say the rules won’t be different this time. The Taliban provide the desired stability in the region that Afghanistan’s neighbors prefer. They will have to make a deal with the U.S. to swear off on Al-Qaeda and to enact reforms on things like the abuse of women. But the key for all parties is stability of the region and despite the obvious distaste for the Taliban, they are best suited to develop the next stage in the Great Game, which is to expand the infrastructure of the country to market the natural resources of the entire Caspian Sea region. There are volumes of evidence to support it. For instance, Assistant Secretary of State for South and Central Asian Affairs Richard Boucher made this statement in a 2007 speech. So, one of our goals in trying to work in Afghanistan is to stabilize Afghanistan, so it can become a conduit and a hub between South and Central Asia so that energy can flow to the south. Ideas and goods can flow to the north. People can move back and forth. Intellectual influences can move back and forth. And so that the countries of Central Asia are no longer bottled up between two enormous powers of China and Russia, but rather they have outlets to the south as well as to the north and the east and the west. I think as we look at this region strategically we are trying to change the outlook, the ways of doing business, the opportunities for every country in the region. Mexico tells Obama/Holder No Mas! 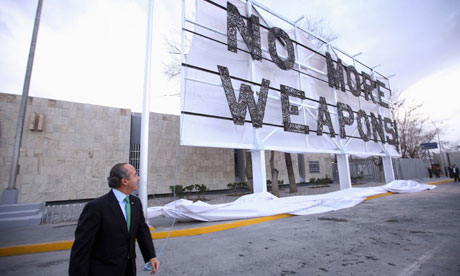 The Mexican president, Felipe Calderón, has unveiled a “No More Weapons” advertising board, made using crushed firearms, near the US border and urged the US to stop the flow of weapons into Mexico. The board, which is in English and weighs three tonnes, stands near an international bridge in Ciudad Juarez and can be seen from the US. Calderón said its letters were made with weapons seized by local, state and federal authorities. Before unveiling the billboard, the president supervised the destruction of more than 7,500 automatic rifles and handguns at a military base in Ciudad Juarez. He said more than 140,000 weapons had been seized since December 2006, when he launched a crackdown against drug traffickers. More than 47,500 people have been killed since then. Ciudad Juarez, where more than 9,000 people have died in drug-related violence since 2008, is one of the cities most affected by the violence. The Mexican government said a federal prosecutor assigned to a northern state had been detained on suspicion of protecting the brutal Zetas drug cartel. The attorney general, Marisela Morales, said the federal prosecutor, Claudia Gonzalez, had been sent to prison. She did not say when Gonzalez was detained or give any further details. Gonzalez was based in the city of Saltillo, the capital of the border state of Coahuila. The state, which borders Texas, has seen a spike of violence as the Zetas and Sinaloa drug cartels fight for control of smuggling routes into the US. Lt. Col. Daniel Davis is a 17 year Army veteran. He just returned from his 2nd Afghanistan tour. He has published a report that is his personal assessment of the Afghanistan war. It’s not classified, however, he has also published a second classified report which he has submitted to members of Congress. These reports are very damning to the federal governments assertions about the progress of the war. He claims we have been purposely misled in overstating our success. This paragraph sums it up quite well in questioning how is it even feasible we haven’t defeated such an inferior enemy. The United States, along with over 40 NATO and other allied nations, possess the most sophisticated, powerful, and technologically advanced military force that has ever hit the field of combat. We have the finest and most well trained Soldiers that exist anywhere; we have armored vehicles of every type, to include MIA2 Main Battle Tanks; artillery, mortars, advanced rockets, precision guided missiles, and hand-held rocket launchers; we have a wholly uncontested air force composed of NATO’s most advanced ground attack fighter jets, bombers, AWACS controllers, spy planes, signals-interception aircraft, B 1 bombers, attack helicopters, and massive transport jets to ferry our troops and critical supplies where they are needed; we have thousands of unmanned aerial drones both for intelligence collection and missile-launching; we have a helicopter fleet for personnel transport and attack support; we have an enormous constellation of spy satellites; logistics that are as limitless as the combined weight of the industrial world; we have every technological device known to the profession of arms; we are able to intercept virtually every form of insurgent communication to include cell phones, walkie-talkies, satellite phones, email, and even some ability to eves-drop on otherwise private conversations; a remarkably capable cohort of intelligence analysts that arc as educated, well trained and equipped to a degree that used to exist only in science fiction; and our various nations have the economic wherewithal to spend $10s of billions each month to fund it all. And for almost 10 years we have pitted this unbelievable and unprecedented capability against: A bunch of dudes in bed sheets and flip-flops. You can read the report and draw your own conclusions as to its validity. I reference it in this post merely to point out my continued assertion that we have never been fighting in Afghanistan in order to win a war. Go here, here, here, here, here, here and here if you wish to read any of my previous posts on this issue. Lt. Col. Davis has been there. Does he have some agenda? I have no idea. He is in no way promoting what I am. His concern is clearly for the wasted lives of the soldiers in a war we have no intention of winning. That’s certainly a worthwhile reason all by itself. His claim is that the Taliban have been steadily gaining strength since 2005 and will surely take over control upon our exit. I contend we were there all along for strategic purposes to promote our national energy policies in the interest of our national defense and his report is just more reinforcement of that. Can you name the country with the lowest violent crime rate in the world? Perhaps a tyrannical regime in which the people are ruled with an iron fist and fear any reprisal from violence? A strong police state nation in which crime is simply not tolerated? You may be surprised to learn it is a country that doesn’t even have a full-time standing army. Yes, it’s Switzerland. Why is this the case? Because Swiss citizens are well-armed and well-trained in how to use their weapons. From a BBC report which you can read here, comes this statement. Every male Swiss citizen serves in the military for a short time each year for the better part of their lives. They keep their rifles at home. Women are encouraged to own a firearm, but not required. The point is that deterrence works wonders. Gun crime rates are so low that statistics aren’t even kept. Is Detroit ready to lead the 2nd half comeback? There’s a huge buzz after the Super Bowl Chrysler ad with the unmistakable voice of Clint Eastwood. I know everyone is searching for something positive to point to in light of our wretched economy. Especially in Michigan. I’m a resident so I live it everyday. But is this a tad bit of a stretch? Why? Maybe because Chrysler is now a foreign-owned car company. That’s right, we no longer have the Big 3 domestic automakers. Fiat owns Chrysler courtesy of the U.S. taxpayer bailout package. You spent $1.3 billion of your tax dollars to enable Chrysler to sell out to Fiat. The total cost of the auto bailouts has been revised up to $23.77 billion. It also doesn’t help that they didn’t even film the commercial in Detroit. Or that the spokesman, Clint Eastwood, has no ties to Detroit or the automakers. Or the fact that any resurgence due to the auto bailouts is lost among the residents since southeast Michigan has three of the most miserable cities in which to live. Or the fact that Mayor Dave Bing is fighting desperately to stave off a bailout of the city which is slated to run out of money by May. Or that GM only sold 603 of its much-hyped Volt in January. There is a true positive in that the state unemployment rate has dropped substantially in falling to 9.3% from a high during the recession exceeding 15%. However, the state suffers from the same malady as the nation in that the rate drop has a large component of people who have dropped out of the work force. There are some positive signs for Michigan and the worst may be behind it, but I think it’s premature to bust out the Super Bowl ads highlighting it just yet. Clint is the man and I love his movies, but I think he should researched this role a little more. President Obama – where have the 6,851,000 jobs gone? Have to throw my two cents in on the latest unemployment numbers. It’s becoming quite clear that Obama is going to have his high 7/low 8 unemployment number for the November election. That allows him to sell his stimulus as a success if the number is below 8% as he promised taking away one of the GOP’s biggest talking points of the last couple of years. They had better start selling the numbers that really matter which is the number of employed people in this country, rather than the skewed numbers of the unemployed. Directly from the Bureau of Labor Statistics, Table A, Household Data. The number not in the labor force. January 2012 – 87,874 (in thousands). The number from January 2009 when Obama took office – 81,023 (in thousands). Subtract the difference and we get 6,851 (in thousands). It means we have 6,851,000 less people working today than we had when Obama took responsibility. Nearly 7 million less Americans working (and paying taxes) today than just 3 short years ago. Obama can’t dispute those numbers because they’re from his own agency, the same one he uses to promote the unemployment rate number. He can claim his stimulus created millions of new jobs but the numbers don’t support it. The GOP better get it together quick and start harping on the relevant numbers everyday so the squishy middle gets it before election day. Disclaimer – all of these numbers are BLS numbers which are highly suspect based upon their methodology. However, it helps to use the same source Obama is citing when refuting his claims. Did Panetta gaffe? Did we win the Afghanistan war? Is the leaked NATO report wrong? Did U.S. Defense Secretary Leon Panetta commit a gaffe this week when he let slip early the plan to accelerate the pullout from Afghanistan? After all, the move comes as a surprise to Kabul which was still operating under the end of 2014 timeline. What does this mean? Has stability in the region exceeded expectations thus justifying an earlier than planned exit? In fact, the opposite is likely true. A NATO report entitled ‘State of the Taliban 2012’ has leaked and purports that the Taliban are winning the war with the Afghan people and are prepared to re-establish control as soon as the U.S. steps aside. The U.S. and NATO dispute this claim. Of course, nothing is ever as it seems when Afghanistan is involved. We claimed to enter the conflict (because it’s another undeclared war) in response to the 9/11 attack in order to eradicate the Taliban and subsequently Al-Qaeda and Usama Bin Laden. That’s the narrative for public consumption at any rate. The truth is far from it and the U.S. pullout without completing the stated mission vindicates it. Let’s review. In 1995, Turkmenistan and Pakistan were negotiating a proposed pipeline with an Argentinian company called Bridas Corp. in order to secure a pipeline from the Caspian Sea (which is landlocked) to an open sea port. The logical path was through Afghanistan, however, a civil war was still underway in the wake of the Russian pullout when they lost their war there. This pipeline is called the Trans-Afghan pipeline (TAPI) and has been dead or alive in varying degrees for decades now. It could not be built without stability in Afghanistan. UNOCAL was the primary U.S. corporation in line to benefit from this pipeline. UNOCAL had strong ties to the Bush administration. In 1998, a UNOCAL executive named John Maresca testified in front of Congress as to the need for pipeline expansion in this region. Here is a good primer on the entire history of the pipeline – http://www.pm-pipeliner.safan.com/mag/ppl0411/r06.pdf. Here is an excerpt from a Chicago Tribune article from March 18, 2002. Read it here. Did you know that Hamid Karzai, the Afghan President, is a former UNOCAL employee? The situation has evolved immensely since the early 90’s when it started as UNOCAL is now completely out of the project. Karzai is considered a U.S. puppet installed by Bush and will likely be replaced once the Taliban retake control of the country. Fast forward to 2001 and we had the 9/11 attacks. The perfect opportunity to enter Afghanistan and secure the region for our strategic energy policies. I know what your thinking. Another 9/11 conspirator. Not at all. My position has always been one that our government is an opportunistic one. They take advantage of geo-political events in order to execute policy goals. Creating a false flag event such as a government planned and executed disaster such as 9/11 would take too many people involved to ever keep it quiet. Do they ‘allow’ events to happen that they have knowledge of if it will benefit them? Do they actively engage as with the negotiations prior to 9/11 with Bin Laden and the Taliban over pipeline access in exchange for Taliban recognition? Both Clinton and Bush played ball here so it’s not at all a partisan issue. You decide.